If you wanted to have a bike built and cost was not an issue, who would you ask to build it? I would consider an Alex Singer, or perhaps a Mariposa. One of Steve Hampsten's Tournesol would also be high on the list. But in the end I think I would call Peter Weigle. I don't know enough about framebuilding to declare Peter the best builder around, and I wouldn't want to judge if I did. It's just that Weigle bikes mesh so well with my own view of what looks right and works well. And Peter is a great guy who spends a lot of time in the saddle testing his own bikes and trying out bikes built by the old constructeurs. He sent me these photos of one of his bikes a few days ago. The photos were taken by Ken Toda and are of the bike that was awarded 'Best in Show" at this year's Le Cirque du Cyclisme. The rest of the photos are here. By the way, Peter doesn't have a web site; he doesn't need one. What do you think? Who would build your dream bike? I like the Weigle butIMHO it should really have centerpulls. 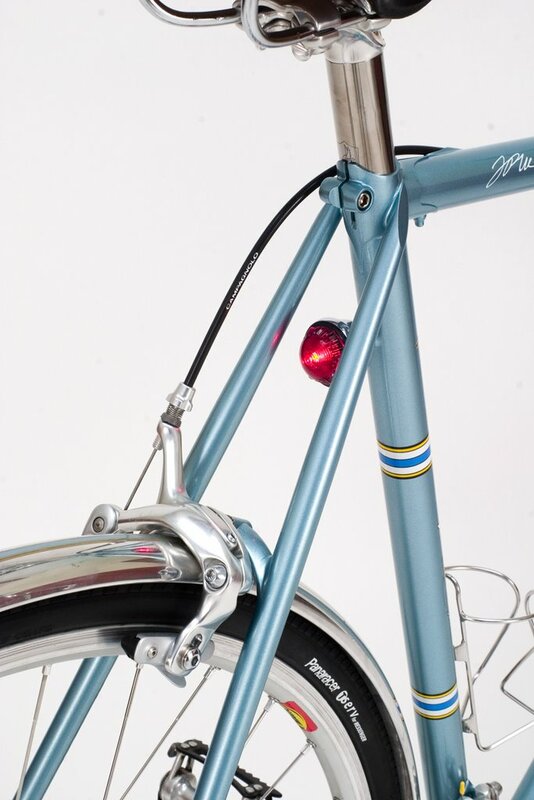 The detailing on the front rack, where it bolts into the fork crown itself, just seems wrong. Otherwise, damn damn nice machine. Me? I have put myself on the waitlist for a Mariposa. I have put myself on the wait list for a Richard Sachs, which, when it arrives four years from now, will replace my LiteSpeed. 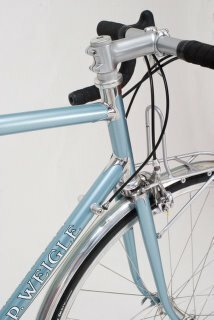 I am now contemplating the replacement for my randonneuring machine - a Rivendell Atlantis. 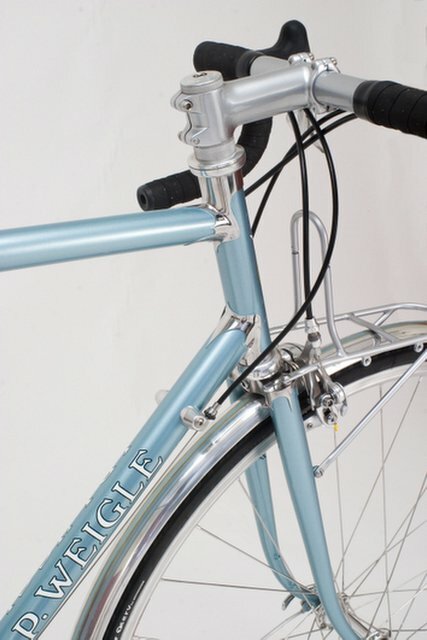 It will boil down to a choice between Peter Weigle or Sacha White if handmade, or if a production frame, the Rivendell Saluki or the Kogswell Porteur. A difficult decision, as there are so many great options today, for custom and short-run production frames. Thanks for posting these. I saw the Weigle review in VBQ and if VBQ has a fault it would be the lack of color pictures. Black and white just doesn't do this bike justice! I think I'd have to go with Sacha White. He's about my age, and just now coming into his own. Someday, his bikes will be the thing of legend. Beautiful bike. Although it may be obvious to other's eyes, is that traditional diameter tubing or OS? The bike is oversize if I remember right and only weighs like 23 pounds. The price is around $4500 for the frame, fork, rack, lights, and stem. For myself I put my name on the list for a Curt Goodrich. Thanks Chris for posting these pictures.I thought I would add these comments. The bike was built with oversize tubing, and 700c wheels. The brakes were chosen because of their performance. See VBQ Vol. 4 #2/Weigle Test, pg. 39 where Jan Heine states "The Shimano Ultegra standard reach brakes work well. In wet weather, they offer excetional braking performance, superior to my beloved centerpulls." If ordered, I will braze on mounts for cantis, or centerpulls. A Rene Herse that sits in my shop has the front rack bolted to the sides of the fork crown. Pictures of this can be found in the Rene Herse book/Rebour drawings... The Data Book also shows many examples of racks bolted to the top of the crown, just like my bike. No right or wrong, just another way to do it. I hope you enjoy these pictures. I am currently riding my new 650B green machine, and so far have tested 4 different pairs of tires on it. 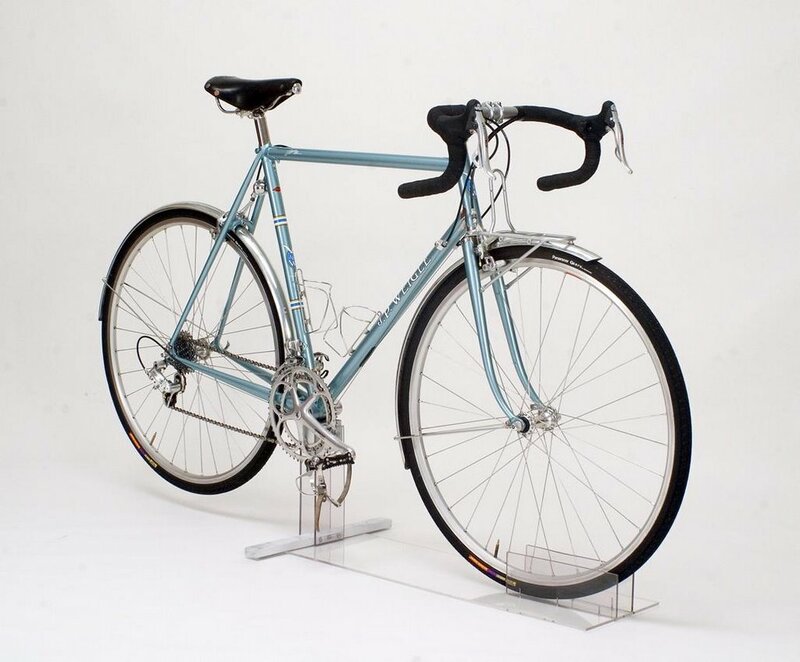 This bike is equipped with cantilever brakes, and the front rack mounts to the canti posts with special bolts, and into the "brake hole" in the center of the fork crown,,,,,, just like the other Rene Herse that sits in my shop. Building modern randonneuring bikes a builder needs to remain flexible when it comes to component choices, and how they are attached to the frame.. I'm sure it was no different in 1940, 50 or 60! Mr. Weigle: Can you enlighten us on the geometry of this bike? Especially the st an ht angles and fork offset and resulting trail? Thanks, Rick "stunned by this bike" Hill. The geometry as it was listed in VBQ is HT 73 degress, seat tube 72.5 degress, fork rake 60mm, trail 42mm, chainstays are 45cm. It is based off of a Alex Singer bike thats was in a front end geometry article in a earlier VBQ. I should add he also made a 50mm raked fork for the bike and it was tested in the article. All of the info on the bike is listed in VBQ Volume 4 Number 2. A clarification is needed. The pictured bike is not the VBQ test bike in Volume 4, Number 2. That bike now lives in Kentucky and was recently mentioned by Jan Heine and the current owner, on the Classic Rendezvous site on 7-16/17/18 (posts # 168-223-243-256-274-etc.) its in a thread about 753 tubing ( the test bike is NOT built with 753,it just happens to be in that thread). As Travis mentioned, the test bikes head angle and fork rake were similar to a Singer's in a previous VBQ article.. The other dimentions on the frame, size, seat angle, drop, chainstay lenght etc. were chosen to suit my preferences, and to see what influence they would have when coupled to the chosen front end dimensions, and tube set I planned to use. The test results in the review, and the new owner's comments were favorable and mirrored my own feelings about the bike, smooth as silk, and sneaky fast! In response to Rick's question about the pictured bikes angles, rake and resulting trail. This newest "shop" bike, built in May of this year, was designed to be ridden with a handle bar bag, but no rear rack. It is a low trail front end that works well in this situation. If I planned to use a rear rack also, I would have tweaked the geometry slightly to compliment that choice. Some of the dimensions are similar to the VBQ test bike, but many are different. Why would I do that when the VBQ test bike was such a pleasure to ride? As I mentioned in the VBQ articles side bar, each new design I build for myself and then test on the road, allows me to explore the handling "range" and sense how these subtle changes influence the bikes ride. This becomes useful when designing frames for my customers. Could I build them all just like the VBQ bike and have everyone be happy? Probably, but I feel I have more to offer, and I'm always trying to improve the breed. I know I'm not really answering Rick's guestion directly, but to me, the head, seat/angle, rake/trail and drop numbers are not silver bullets. There is no "magic" number that makes a bike great. The numbers all need to work together and compliment the tube set, its a matter of Balance. Choose an unbalanced combination of "magic" numbers and the ride may be ok. Choose the right combination, and the ride will be brilliant. By the way, I love my new bike! Peter I did not noticed till now that the bike pictured does not have the pump behind the seat tube. The chainstays also look shorter on the bike above.EIther way you it the nail on the head with looks with both. The bike in VBQ was a instant favorite of mine and has been looked a hundreds of times, There is something about the two mentioned bikes that keep me looking. One of those I have to ride own one someday things. I assume we're talking rando style, which takes me to Japan, not France or the U.S.. Grand Bois by a landslide, with Toei cleaning up in near second place. My dream frameset was built for me by Hiroshi Iimura several years ago. 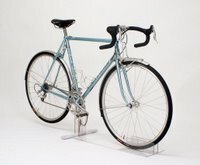 I currently have my matte silver (custom paint option) Ebisu configured as a singlespeed CX bike. I chose singlespeed so that my girlfriend and I can ride together and I can still be challenged - Plus I prefer the simplicity. I've built her up with Victory cranks, Chorus rear brake, B17 Saddle, White hubs and freewheel, and Nitto Rando H-bars. Thanks to Velo Orange for the Top tube protector, the chainstay protector, and the toe clip covers which I turned into a brake lever cover.